Measuring Jug Printed Graduation is moulded in polyproplene and have excellent clarity as well as very good chemical resistance. The prominent feature of these jugs is the easy to read printed graduations. The rectangular handle provides significant advantage for easy pouring and handling. These jug are also autoclavable. 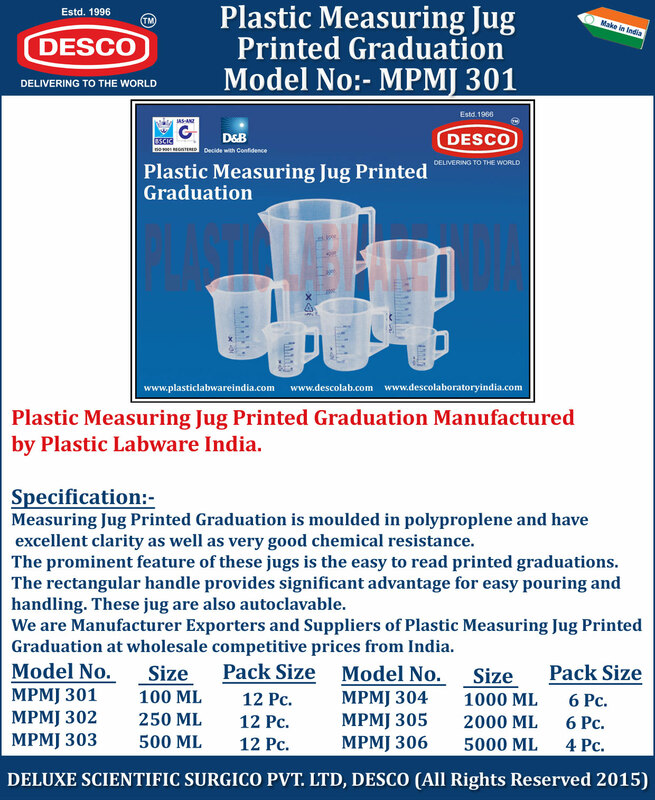 We are Manufacturer Exporters and Suppliers of Plastic Measuring Jug Printed Graduation at wholesale competitive prices from India. MPMJ 301 100 ML 12 Pc. MPMJ 302 250 ML 12 Pc. MPMJ 303 500 ML 12 Pc. MPMJ 304 1000 ML 6 Pc. MPMJ 305 2000 ML 6 Pc. MPMJ 306 5000 ML 4 Pc.